Wenatchee AppleSox pitcher Curtis Bafus has been named the West Coast League’s Co-Pitcher of the Year for his work in the 2018 season. The announcement came along with the WCL’s end-of-the-season All-WCL teams and awards announcements on Wednesday morning. Along with sharing the award with Corvallis’ Landen Bourassa, Bafus also appeared with first baseman Connor McCord on the All-WCL First Team. Additionally, outfielder Johnny Sage and pitcher Hunter Boyd appeared on the Second Team. Infielders Joey Magro, Jake Taylor, Mason Marenco, catcher Cory Meyer, utilitymen Jacob Prater, Michael Spellacy and Jeremy Yelland were all honorable mentions. Bafus, an incoming senior at Virginia Commonwealth University, went 4-5 with a 2.87 ERA in 11 games, 10 starts, this past summer with the AppleSox. This is the third time that Bafus was honored for his work in the 2018 season. 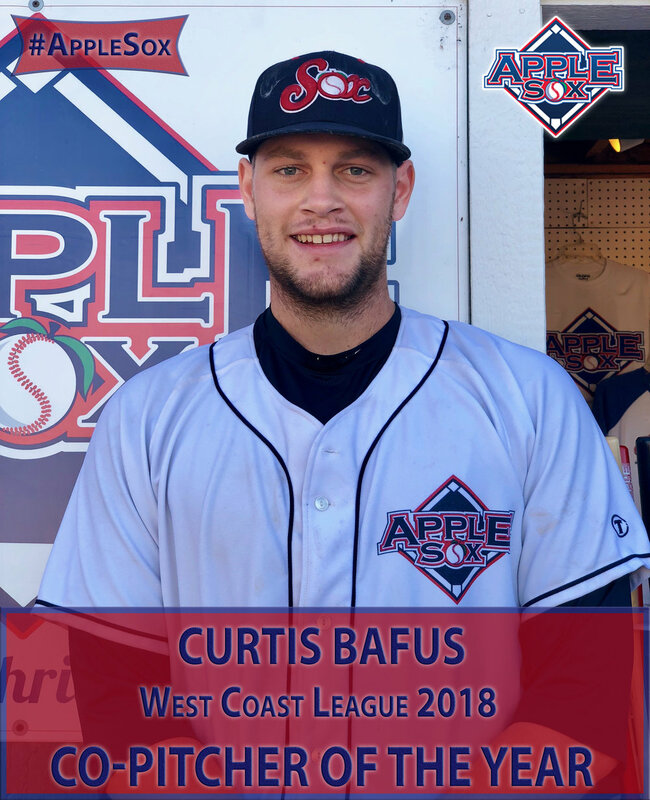 Bafus won the WCL Pitcher of the Week award for July 2-8 and represented the AppleSox as the starting pitcher in the WCL All-Star Game. He joins Owen Jones (2011) as AppleSox pitchers to earn WCL Pitcher of the Year. The right-hander proved himself early on as the AppleSox’ ace. Seven of Bafus’s first eight starts of the year were quality starts. He led the league in strikeouts (72) and innings-pitched (65.2) and tied for the league-lead with 10 starts. In his only relief appearance of the season, Bafus was still a workhorse, tossing the final six innings of an 8-7 victory over Port Angeles on June 24 to pick up his second win of the season at the time. Bafus retired 13 of the final 16 batters that he faced and seven of those 13 went down via strikeouts. McCord, an incoming junior at Western Oregon, finished third in the WCL in both batting average (.346) and RBIs (37). He led the AppleSox in those categories as well as home runs (six), hits (56), extra-base hits (16) and runs (27). McCord reached base via at least one walk or base-hit in 35 of his 42 games played. He reached base in 18 consecutive games from June 22 to July 19 for the longest streak on the team. In addition to his work at the plate, McCord also was a force on the mound. The southpaw went 3-5 with a 4.00 ERA and only allowed four earned runs over his final 18 innings-pitched in the season. Second-team members Sage and Boyd also proved their worth in 2018. Sage tied for the league-lead with 28 walks, finished third with a .442 on-base percentage and hit a seventh-best .326 at the plate. His 10 doubles were tied for second-most on the AppleSox. The incoming junior to Purdue reached base in 17 of his final 18 games of the season. Sage never went more than a game without reaching base in 2018. Boyd tied Bafus and several others for the most starts (10) in the WCL this summer. His five wins, 57 strikeouts and 63.2 innings-pitched finished tied for first, tied for fourth and third, respectively, in the WCL. The right hander and Moses Lake native also tossed one of two complete games in the West Coast League this season. He entered the ninth inning on July 18 in line for a shutout and, though he didn’t get it, still went to the distance. Boyd struck out eight in that game, one of four times this summer in which he matched his season-high in punchouts.